This post is sponsored by TN Vacation. As always, all opinions are my own. Memphis is a rhythmic southern city located in the southwest corner of Tennessee along the Mississippi river. Just a three hour drive from Nashville, it makes for the perfect weekend getaway. Since my college town of Oxford, Mississippi was just an hour away from Memphis, we would frequently visit for formals and quick trips. It wasn’t until I went on a school trip to the Civil Rights Museum that I really realized and began to appreciate just how rich the history of Memphis truly is. Last weekend, my dad and I went to Memphis for the Six Degrees to Tennessee Roots Jam. It was truly one of the most unique shows I’ve ever attended. It one-of-a-kind jam session where six artists spanning across different genres traced their musical influences back to the place where it all started: Tennessee. The show took place at the historic New Daisy Theatre on Beale Street. A parade of talented artists including Elle King, Dustin Lynch and the Isley Brothers joined the house band The Roots (you may know them from The Tonight Show Starring Jimmy Fallon) on stage for epic performances that will never be recreated. Each time I visit Memphis, I gain a further appreciation for the city and its impact on music all over the world. Planning a trip to the home of blues and rock n' roll? 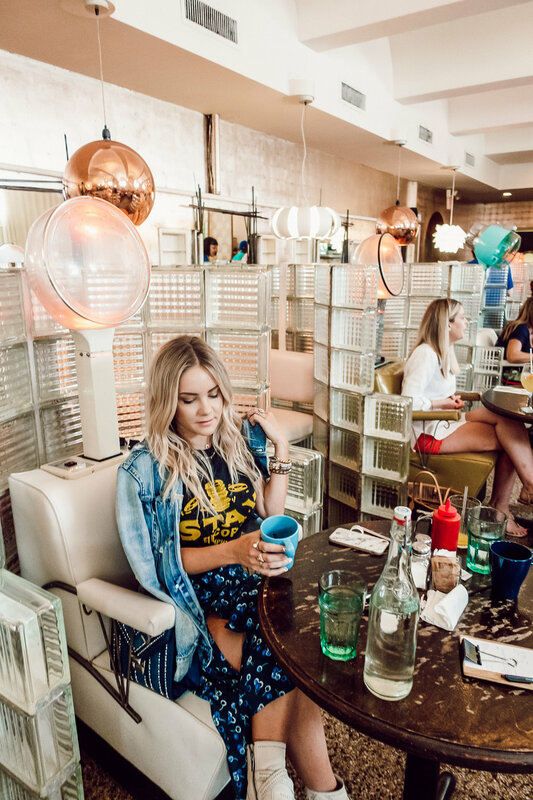 Below I’m sharing how my dad and I spent our quick trip and a few of my favorite places to eat, drink and explore. 11 am - We arrived in Memphis just in time for lunch. After a quick walk down Beale Street, we headed to lunch at Majestic Grille. Originally built in 1913 as a movie theater called the Majestic No. 1, the restaurant offers a unique dining experience that transports you back in time. I couldn’t help but think of all the black and white films that debuted there long ago. We opted for a light lunch to save up for all the BBQ we knew we would inevitably be eating later that night. I highly recommend their Waldorf salad. It’s also centrally located on South Main in a great area to explore. 12:30 pm - After lunch, we headed to the legendary Sun Studio. I took this tour a few months ago when I was in town for Memphis Fashion week, and I loved it so much that I had to bring my dad back. Sun Studio is where stars like Elvis Presley and Johnny Cash got their start. The tour guides are passionate and energetic and really make the tour come to life. It’s pretty surreal to stand in the same spot where Elvis first recorded, and to be in the room where songs like “That’s All Right (Mama)” and “I Walk The Line” were recorded. Another interesting thing to note about Sun Studio is that artists still record there today. 4 pm - After our tour, we checked into our room at The Peabody. 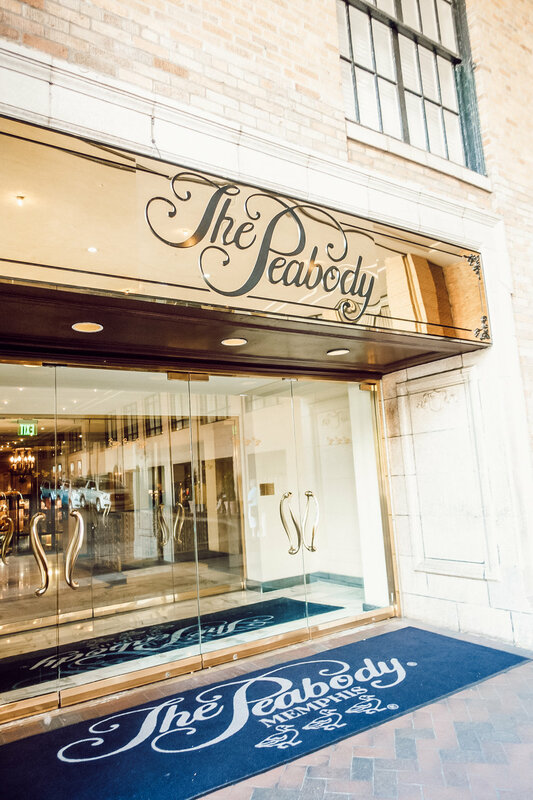 Known for their famous “Duck March,” The Peabody is always a great place to stay while visiting Memphis. Legendary, elegant and charming are a few words that come to mind when I think of The Peabody. My favorite part about staying there is the central location. Located just a few blocks from Beale Street, we were able to walk to nearly everything. If you’re like me, you may be curious just how the Duck March tradition began! The tradition dates back to the 1930’s when the hotel manager and his friend places ducks in the fountain as a prank. Nearly 90 years later, the ducks still visit the lobby fountain at 11 a.m. and 5 p.m. each day. 6 pm - After freshening up in our room, we made our way over to the New Daisy Theatre for the Six Degrees to Tennessee Roots Jam. Guys, this show was epic! For starters, the New Daisy was originally built in 1942 and was the perfect setting for the show. The Roots served as the house band and accompanied the seven artists spanning all different genres. Throughout the night we heard performances by Elle King, Kaleo, Dustin Lynch, Estelle, Project Pat, The Isley Brothers and Memphis’ own Booker T.
Each artist performed an original song and also covered a song that traces back to Tennessee. A few of my favorite moments were JJ Julius Son from Kaleo’s cover of The King’s “That’s All Right (Mama)” and Elle King’s tribute to Aretha Franklin with a rendition of “I Never Loved a Man (The Way I Do You).” My dad’s favorite performance of the night were The Roots solos. That band really knows how to put on a show! It was an unforgettable night of music and memories that I’m so glad I got to experience with my dad. 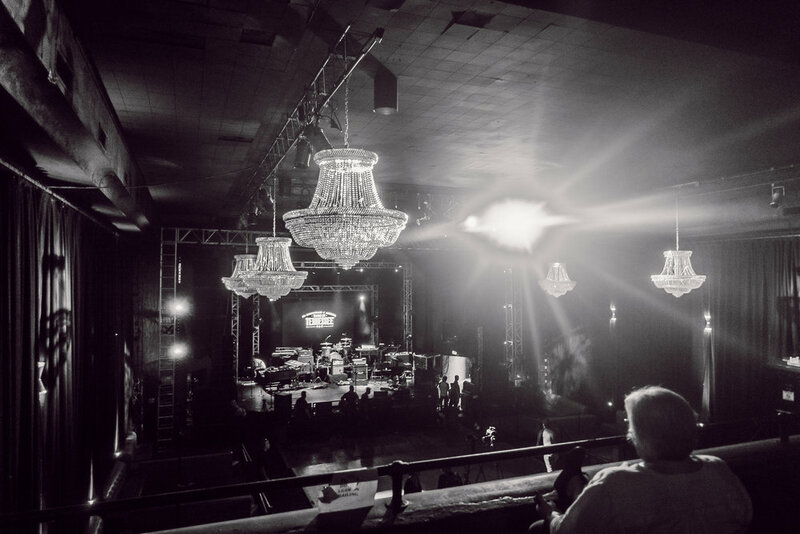 The concert launched Tennessee Music Pathways, a program designed to guide visitors through the history of seven musical genres that call Tennessee home (blues, bluegrass, country, gospel, soul, rockabilly and rock ‘n’ roll.) It guides them through points of interest via an online travel-planning experience. The New Daisy Theatre is one of the many stops along Tennessee’s musical pathway. 10:30 pm - Would it even be a trip to Memphis without some BBQ? After all that fun we had to grab some late night BBQ at Rendezvous. Rendezvous is located in a basement of an alley downtown. You can smell the smoky aroma as you start to walk down the alley, and you know you’re in the right place. I had the pulled pork plate and my dad was a big fan of the ribs. Not only is the perfectly seasoned southern food amazing, but old school atmosphere makes the Rendezvous experience. 10 am - We slept in a little on Sunday morning and then headed to brunch at The Beauty Shop. The beauty-shop-turned-restaurant was formerly Priscilla Presley’s curl and dye spot. The whole place has a unique retro vibe with original terrazzo floors, mint green sinks and more. I even sat under an old hooded Belvedere hairdryer as I enjoyed my meal. I had the English Scramble and my dad had the New York City Breakfast and both were delicious. 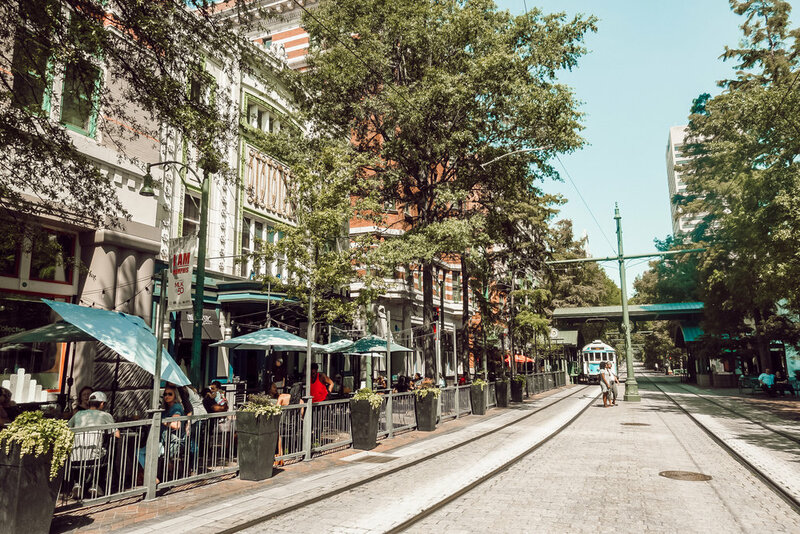 The Beauty Shop is located in the Cooper-Young District which is a hip and trendy area that I would love to explore further on my next trip to Memphis. 12 pm - After checking out of The Peabody, we decided to take one last walk down Beale Street. One of the most well-known streets in America, Beale Street is a melting pot of neon signs, jam sessions, bars and restaurants. It’s interesting to see how different it is during the day. 1 pm - After about six trips to Memphis during my lifetime, I finally made it to Elvis Presley’s Graceland! 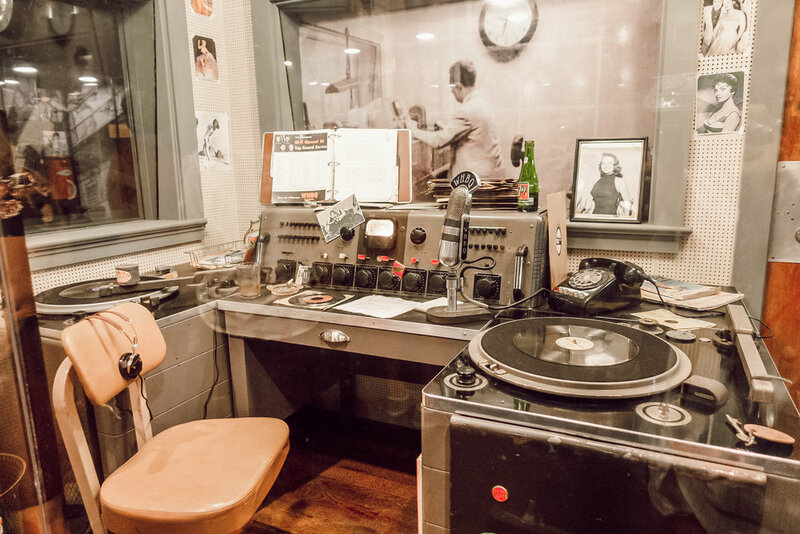 Memphis, TN was the rock-and-roll legend’s home for more than 20 years and I loved getting a glimpse into the personal side of Elvis Presley. More than anything, I really enjoyed learning about his humble upbringing in Tupelo, Mississippi and the importance of his family. Home movies play on the screens throughout the tour and you really get an idea about the kind of person Elvis was without all the fame and glitter. Fun fact: my mom has done Elvis’ daughter Lisa Marie’s makeup and I had the chance to meet her a few years ago. It was really fascinating to see how she grew up and to imagine what life must have been like as a child at Graceland. My favorite part of the house was the entryway with the chandelier and cobalt blue curtains. I hope you enjoyed reading about our daddy daughter trip to Memphis! Each time I visit, I find more and more to love about the home of blues, soul and rock n’ roll. Read more about the Tennessee Music Pathways to help plan your trip to Tennessee. As always, feel free to reach out in the comments below if you have any questions!